York, PA -- When the Red Land Little League All-Stars are honored at the York Revolution game on Sunday, September 20, it will be about their last stop on a whirlwind tour of media and pro ballparks after their dominating run to the championship game in Williamsport and the U.S. National Championship. After captivating not only Pennsylvania but the country, the team will be a part of one last celebration in their home county, as the Revolution battle the Somerset Patriots on the final day of the Atlantic League regular season. Game time is at 2 p.m., with the gates at Santander Stadium opening at 1 p.m. PLEASE NOTE THE SUNDAY SEPTEMBER 20 GAME WAS ORIGINALLY SCHEDULED FOR 5 P.M. - THE GAME TIME HAS BEEN CHANGED TO 2 P.M. The entire Red Land Little League team is scheduled to be in attendance, and the team will be taking batting practice on the field from 1 to 1:30 p.m. Fans entering the gates during that time are welcome to watch, and may go down to the bottom of the seating bowl to see the players, take pictures with them and ask for autographs. The typical full-team autograph session with the Revolution will proceed from 1:05 to 1:20 p.m. in the Apple Subaru Lawn Section. Catch on the field will be cancelled for the day to accommodate the Red Land players taking BP. Vehicles to introduce the players and coaches around the warning track will be provided by Apple Chevrolet. 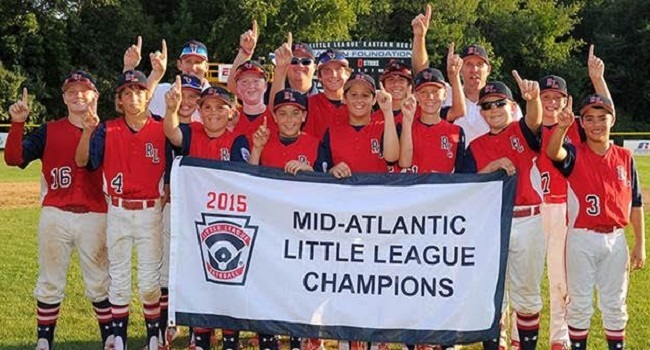 Best of all, the Revolution will wear Red Land Little League replica jerseys for that day’s game. The uniforms are close to exact replicas of what Red Land wore through their local, state and regional tournaments leading to the Little League World Series. (Photos above, below, and attached. Fans will have the opportunity to bid on the game-worn jerseys during a silent auction through the first half of the game. Winning bidders will be able to collect their jerseys directly from the Revolution players on the field following the game, once payment information is provided. The jerseys, like what Red Land Little League wears, are red vests over navy blue t-shirts, and will include names of the Revolution players on the back. Winning bidders will be provided at no charge with a new t-shirt same as what the players on the field will wear, with the Revolution logo on the left sleeve to complete the uniform. Starting bids will be $100, with all the profits from the jersey auction going directly to Red Land Little League. Tickets for the game are available at YorkRevolution.com, and on the team’s mobile site. Tickets may also be purchased in-person at the Apple Chevrolet Ticket office at Santander Stadium. Fans purchasing tickets online may take $2 off each ticket by checking out with the promo code RLWS2015. A portion of all RLWS2015 ticket proceeds will be donated to Red Land Little League, in addition to the proceeds from the jersey auction. Due to it being the final day of the season, there will not be adequate time for any of the Red Land players to be properly evaluated by the Revolution coaching staff, if any might have been interested in turning pro and playing for their home-county team. We have a tryout camp scheduled for April, however. The York Revolution Professional Baseball Club is a member of the Atlantic League of Professional Baseball, and Atlantic League Champions in 2010 and 2011. 2015 is the Revolution’s ninth season of operation at Santander Stadium, the centerpiece of Downtown York, PA, located at 5 Brooks Robinson Way. The facility hosts all 70 home games in addition to myriad events through the entire calendar year. For tickets or more information, please call 717-801-HITS (4487) or visit the Revolution online at YorkRevolution.com.